Play Doh + Marshmallow Eye = Fun!? How can you NOT laugh at this photo? Do you ever go back to your online photo albums and search for a photo? I searched and found this photo. I search in the October 2006 folder and found a true Halloween memory! Let me tell you the back story on this beauty… The photo is from 2006. I was in a “my kids eat too much candy phase and I will not buy candy for Halloween.” Mean Moms of the World Unite! My kids were NOT happy when I told them I would hand out PlayDoh instead of candy. I purchased a huge bag of tiny Play Doh tubs to give out. Note: The tubs were a hit with young and old and were the topic of conversation for months. Anyway back to the photo. While trick-or-treating my then 10-year-old, 8-year-old, and 3-year-old went to a house where they were given marshmallow eye balls. My husband said that the kids talked about the eye balls all the way home. Once home it was like a science experiment as Play Doh met eye ball to create weird eye prosthesis??? The kids had the best time placing the Play Doh on different parts of the body. 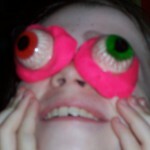 My 8-year-old walked in to a wall while wearing both eye prosthesis. Ouch! I love the idea of giving out those mini-tubs of Play Doh! Awesome! I like the play doh idea. And that picture? Priceless!